There are 25 reviews of Trèfle Pur. Clean orange & neroli. Not too bitter. Clear notes. The middle notes are greenish and bright. Just enough galbanum; not over done. Citrus and green notes hang on for quite some time. I feel though, TP is rather linear, leans towards dull. Nice fresh citrus-y green cologne. The opening has a mossy herbal bitter orange combo like Hermes' Eau d'Orange vert, and I can definitely see the resemblance to it which is also a cologne I love. I do find the drydown is a little more herbal and spicy than the more mossy woodsy EOV, but I do still get some mossy woods here too. I wish there could be a bit more oakmoss (common problem for me who discovered my great love for this note and then really got into perfume right after it was largely regulated out), which might help the lasting power a bit. It does last at least as long as EOV though, probably more like the concentree, so that's a plus. It is a pretty unisex scent like most Aetlier and Hermes colognes. I'd wear this a lot in the warmer months. Citrus dominated by galbanum. Neroli cuts through the dominance. Very green notes, and also very deep. This is turning out to be one of the best GREEN scents. The violet adds a "just rained quality" without any ozone smells. Unfortunately it doesn't last long. Extremely beautiful blend of notes with basil being dominant, that smells like a wet field of grass during the rain. It has a petrichor scent to it. Sillage is moderate while longevity unfortunately isn't that great, becoming a skin scent in about 2 and a half hours. If it weren't for the subpar longevity, I'd say this was one of my favourite fragrances based on the scent. The best fragrance from Atelier Colognes remains Cedrat Enivrant in my opinion. 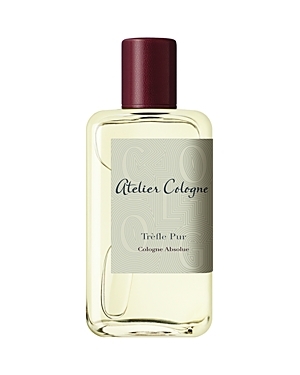 Atelier Cologne Trefle Pur Cologne Absolue Pure Perfume 3.4 oz. There are no member images of Trèfle Pur yet. Why not be the first?